One of the best parts about the Austin Healey Sprite is the styling feature that gives the car its famous nicknames: Bugeye or, in its British homeland, Frogeye. These names, of course, come from the distinctive upright headlights of the car. But what if, instead of those simple headlights, you could have something wildly overcomplicated? Wouldn’t that be much better? Of course it would. 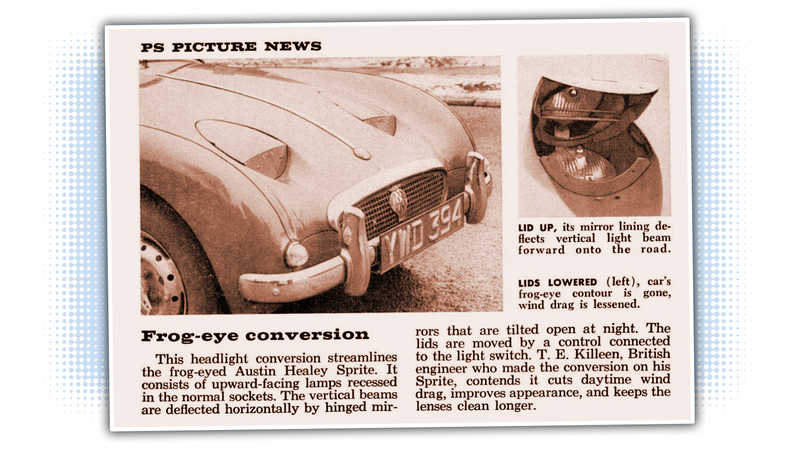 Interestingly, the Sprite was supposed to have hidden headlights, but money issues forced Austin to take the cheaper route of fixed-position lights, which is how the Sprite’s friendly, distinctive face was born. Inventor T.E. Killeen seems to have not been satisfied with this decision, which may be why he engineered this solution: he’s developed hidden headlamps, but they’re radically different from how these normally work. The headlamp sealed-beam unit itself is set into the bodywork facing upwards, and the cover over the light has a mirror inset into it. So, when you turn on the lights, the bulb turns on, the cover opens, and the angle of the mirror over the horizontal lamp should bounce most of that light back onto the road. It’s supposed to cut down on (daylight only) wind drag, though the flat semicircles of the covers on the body likely don’t help that much; if you’re going to go through this effort, you’d think you’d make a cover that sits flush with the lines of the body. This is a weird solution to a problem that only barely exists, and, arguably, takes away a lot of the car’s charm. Still, I love that someone once went through the effort to do this, and, really, it seems pretty well realized. For something kinda bonkers, I mean.